Because country isn't exactly my favorite genre of music, I'm sure I often overlook quality tunes I'd actually enjoy if I ever bothered to give them a chance. 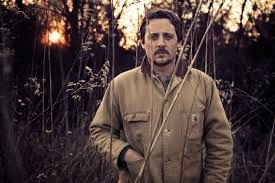 Luckily, when Sturgill Simpson's album Metamodern Sounds In Country Music started appearing on many critics' Best of 2014 lists earlier this month (AND Sturgill performed on both The Tonight Show Starring Jimmy Fallon & Late Show with David Letterman), I became intrigued & gave it a listen via Spotify. I enjoyed it so much I bought a copy of the CD for my parents for Christmas! They love country. If all modern country music sounded (& looked!) as good Sturgill Simpson, I just might love country too! His voice is beautiful, pure country perfection.